Tieran O'Halloran and Jarrad Butler celebrate one of Connacht's six tries. CONNACHT WILL ENJOY the Christmas celebrations on the back of a record win over Ulster at a packed Sportsground. They dominated from start to finish to back up their excellent Challenge Cup form with a badly needed win in the Pro14. The home fans in the crowd of 7,629 spent the final quarter singing Christmas carols as they ran riot to win by six tries to two. The first of the festive derbies exploded into life when Connacht raced into a 12-0 lead after just 13 minutes despite playing into the teeth of a strong wind. They did not allow Ulster settle and were rewarded for going to the left corner with an early penalty when they got a superb drive from John Muldoon’s take for Eoghan Masterson to score after three minutes. It got better 10 minutes later when a snipe from Kieran Marmion sent Bundee Aki through under the posts for his first try of the season, with Jack Carty’s conversion making it 12-0 and leaving Ulster with a mountain to climb. Former Connacht scrum-half John Cooney pulled back a penalty for Ulster after 23 minutes but a superb take from winger Matt Healy from the restart set in train a move which saw Aki put Tiernan O’Halloran through and the fullback, who signed a two-year contract extension on Friday, made it to the line to extend the lead to 17-3. Cooney pulled back another penalty but Carty cancelled that before the interval to take a 20-6 into the break. Carty extended the lead with another penalty after 48 minutes after Ulster loosehead Andrew Warwick was binned for not rolling away. A yellow card to Ulster centre Louis Ludik for a deliberate knock-on after 54 minutes as Connacht pressed left made it 15 men against 13 for a period and, inevitably, the bonus try was delivered. Connacht again went to the left corner with a penalty and from the drive Ultan Dillane got over, with Carty’s conversion making it 30-6. It got better on the hour when Ulster were again cut open with O’Halloran going wide to send Jarrad Butler over for his first Connacht try, with Carty adding the extras to leave it 37-6. Craig Gilroy pulled back a try after 65 minutes for Ulster but then O’Halloran got back to deny debutant Johnny McPhillips a try after a break from the other 22 — the fullback did, however, pick up a yellow card. And then Eoin Griffin intercepted from inside his own 22 to sprint half the pitch before feeding Darragh Leader and in turn he sent Dillane over for his second try to complete a glorious night for Connacht. CONNACHT: Tiernan O’Halloran; Niyi Adeleokun (Darragh Leader ’64), Bundee Aki (Eoin Griffin ’64), Tom Farrell, Matt Healy; Jack Carty, Kieran Marmion (James Mitchell ’62); Denis Coulson (Peter McCabe ’56), Shane Delahunt (Tom McCartney ’56), Finlay Bealham (Conor Carey ’56); Ultan Dillane, Quinn Roux (James Cannon ’56); Eoghan Masterson, Jarrad Butler (Naulia Dawai ’61), John Muldoon. ULSTER: Jacob Stockdale; Craig Gilroy, Louis Ludik, Darren Cave, Andrew Trimble; Peter Nelson (Johnny McPhillips ’65), John Cooney (Paul Marshall ’62); Andrew Warwick (van der Merwe ’61), John Andrew (Adam McBurney ’46), Wiehahn Herbst (Ross Kane ’48); Iain Henderson, Robbie Diack (Matthew Rea ’65); Clive Ross (Schalk van der Merwe ’49), Sean Reidy (Greg Jones ’36), Nick Timoney. Email “Six-try Connacht blow Ulster away to end year with record win ”. 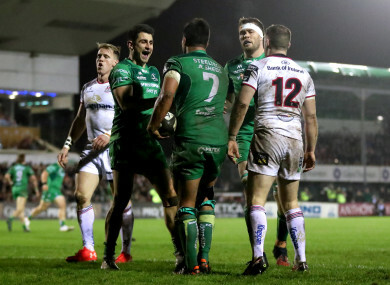 Feedback on “Six-try Connacht blow Ulster away to end year with record win ”.